November the 5th, Guy Fawkes night. We are looking forward to seeing the fireworks light up the sky and having sparklers around the bonfire! 1. Make sure you walk your dog before dusk and get your cat inside before it gets dark. 2. It is best to feed them before dark. Once the bangs start they may not want to eat. 3. Close curtains, put the TV on and try to keep everything as normal as possible. 4. Build a safety den near you, behind the sofa or under the bed (if you have a small dog!). Put a unwashed jumper of yours in there too, this will provide comfort for them. 5. Make sure you have up to date ID tags, just incase, and if you need to let your dog out in the garden then take them out on a lead. 6. If you have rabbits or guinea pigs bring them inside too, if you can, or cover their hutch with blankets – this will provide some soundproofing. 7. 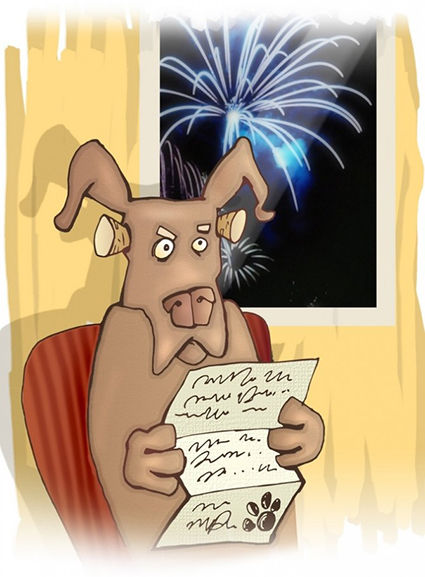 If you are planning on having your own fireworks let all your neighbours know so that they can keep their pets safe indoors. 8. And finally, if you are having a bonfire, please check the base before you light it as hedgehogs and other small animals may have moved in and made it their home!